Whip up a little affection with this unique and fully function favor. 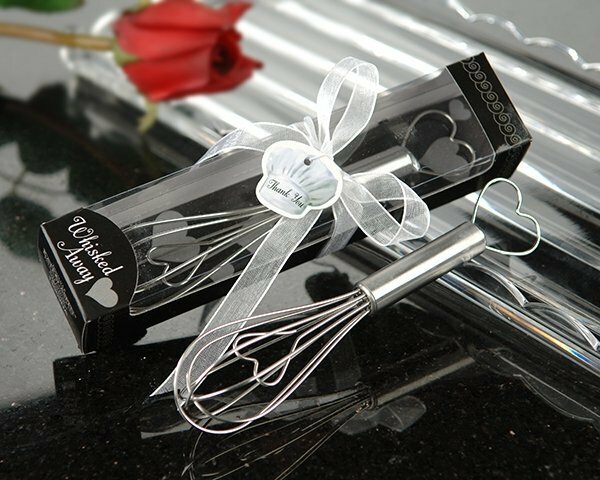 Crafted from stainless steel, our whimsical whisk has a cleverly enclosed heart as well as a heart shaped handle. 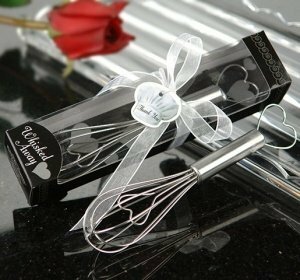 Each favor arrives in a handsome sweetheart gift box, tied with white ribbon against and a chef's hat theme thank you tag to add to the culinary charisma. Measures 1.5" x 6.7". These black and white favors are a beautiful choice for both weddings and kitchen bridal showers! I don't need the boxes I just need the whisks for our little girl's birthday party is this possible?